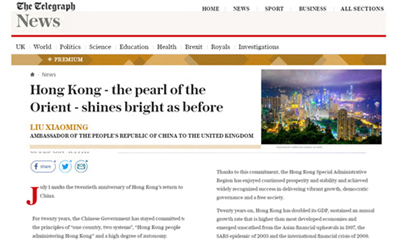 The Daily Telegraph Publishes a Signed Article by Ambassador Liu Xiaoming Entitled " Hong Kong - the pearl of the Orient - shines bright as before "
July 1 marks the twentieth anniversary of Hong Kong's return to China. For twenty years, the Chinese Government has stayed committed to the principles of "one country, two systems", "Hong Kong people administering Hong Kong" and a high degree of autonomy. This metropolitan city has further consolidated its position as a global financial, trading and shipping hub. Today, it is the world's fourth largest financial centre, the eighth largest trading entity, the fourth largest shipping register, the fifth largest container port and home to the world's busiest air cargo terminal. Seventy of the world's top 100 banks have set up offices here. For the past 20 years, Hong Kong has been one of the freest and most competitive economies in the world. Twenty years on, Hong Kong, as one of the world's top rule-based societies, also leads in the Human Freedom Index and has kept a good record in protecting basic rights and freedom. Twenty years after Hong Kong's return, misunderstandings of "one country, two systems" and skepticism of Hong Kong's future still exist among some people in Hong Kong and internationally. Like Gollum's infatuation with the Ring in Lord of the Rings, some of them are entrenched in their colonialist illusion. Some extreme elements even clamoured for so-called "Hong Kong independence". This will lead to nowhere but cost Hong Kong its prosperity and stability. History does not lie. The past two decades prove that the "one country, two systems" policy has ensured common development of Hong Kong and China's mainland. It is the fundamental guarantee and best arrangement for Hong Kong's long-term prosperity and stability. The problems and challenges Hong Kong faces at present are "growing pains" which will be healed by opportunities on the way ahead, like the Belt and Road Initiative and the grand plan of the Guangdong-Hong Kong-Macau Big Bay Area. These opportunities will sustain Hong Kong's future growth and external cooperation. Hong Kong is now an integral part of China. Separatist attempts, including for so-called "Hong Kong independence", will not be tolerated, and foreign interference in Hong Kong affairs will be opposed. Whatever the circumstances, China's national sovereignty, security and development interests and Hong Kong's prosperity and stability in the long run must be maintained. And as a fundamental policy, "one country, two systems" will be strictly followed. Ensuring Hong Kong's success within the framework of "one country, two systems" is a shared commitment and serves the common interests of both countries. I hope the British people will realise the harm of so-called "Hong Kong independence" and share our commitment to maintaining Hong Kong's prosperity and stability, and to advance exchange and cooperation between China and Britain, and between Hong Kong and Britain. I have no doubt this "Pearl of the Orient" will continue to shine ever more brightly in the "Golden Era" of China-UK relations.